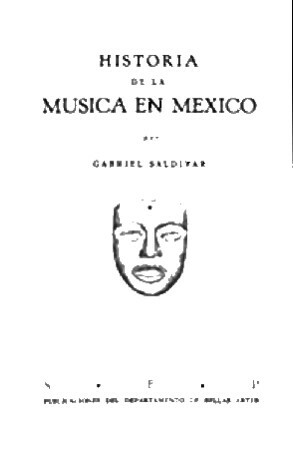 Information: Gabriel Saldivar, author of books about Mexican music and dance. Historia de la Musica en Mexico, Epoca Pre-Cortesian y Colonial. Saldivar, Gabriel. Mexico, D.F. : 1934. Often-quoted work on the history of Mexican music and dance. In Spanish. El Jarabe, Baile Popular Mexicano. Saldivar, Gabriel. Mexico, D.F. : 1937. History of the Jarabe. In Spanish.